To be completely honest, I'm of two minds in regards to awards. Part of me is the skeptic who believes that there are far too many meaningless net awards out there. The idea of "give me your award and I'll give you mine" I find to be disgusting and devaluing of the entire purpose of an award -- to celebrate excellence. I also do not believe in rubbing my success (or lack of success, were that the case) in the noses of other people. Awards can be a way to brag, and that's something I don't like to do either. The fanfic community has treated me graciously, and for that I am thankful. On the other hand, when I discussed the idea of putting an awards page back up with some friends, they said that I shouldn't hide my achievements. I agree that achievements shouldn't be hidden, but it should also be understood that it's not my intent to brag either. I don't go 'fishing' for awards, and I am truly honored when someone decides to give me one. I was inducted into the FanFic Mailing List Author Encyclopedia in 1998 and didn't know it until recently < sweatdrops >. Anime North '99 Honorable Mention I received this award for Deserving. I thought that the fic might be too short. I must have squeaked right in over the minimum length requirement. 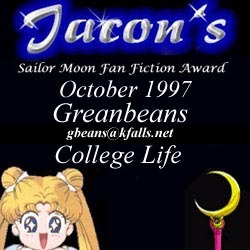 This award is from the Sailor Moon Fanfiction Club (SMFFC) and was given to me for Memoirs of a Daimon. Given during the first week of November 1999.